Eating fried cheese pies can be healthy, they say in the Republic of Adygea in Southern Russia. When those meals are combined with Uork Khabze, the Caucasian version of yoga, the health benefits can multiply. The Republic of Adygea is a beautiful Shangri-La like land of wise people who live long lives. There are winding canyons with grottoes, Circassian apple orchards and highland plateaus with flocks of sheep. Adygea is nicknamed Russia's “Little Tibet" for its unique environs and the general impression that time has stopped. The mountain air and glorious scenic beauty is enough to make anyone lightheaded. 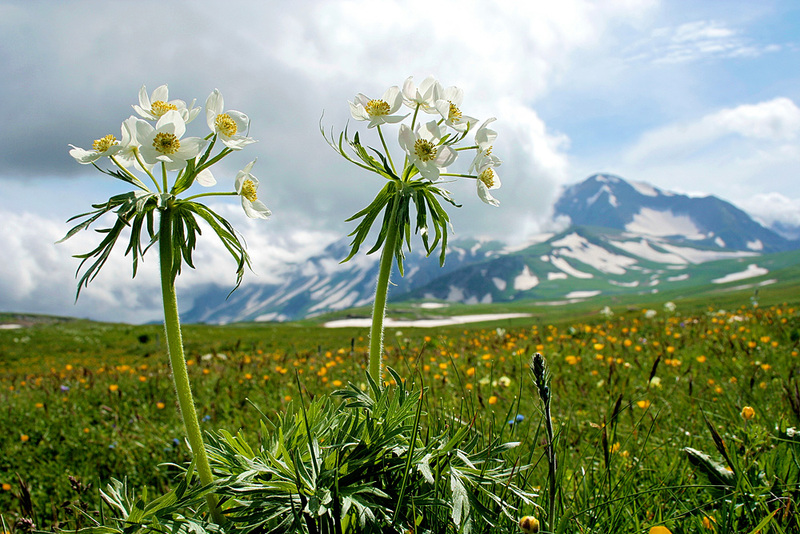 Adygea, which is inhabited by Circassian tribes, is magical. It takes two hours by plane from Moscow to Krasnodar and another couple of hours by car to reach Adygea. On the way from Krasnodar Airport to Maykop, capital of Adygea, a sea of sunflowers with thousands of gleaming yellow "heads" covering the fields on both sides of the road greets the visitor. This magnificent sight is complemented by a panoramic view of the snowy peaks of the Skalisty Ridge on the horizon ahead of you. Adygean cuisine is closely linked to the Circassian spiritual practice Uork Khabze, an authentic Caucasian tradition encompassing a set of yoga-like physical exercises and meditation. The Caucasian tradition of Uork Khabze is a form of spiritual teaching with thousands of years of history. It is currently undergoing a revival. Uork Khabze is translated as “a path for the chosen,” a form of instruction for the elite. In ancient times an invitation to the secret teachings had to be earned not only by belonging to the nobility, but also by display of courage, talent and beauty. Today, a variety of Uork Khabze practices are open to everyone. The modern Caucasus is mostly inhabited by Muslims, but not all locals have an understanding of Uork Khabze, which originated here before Islam reached these lands. The food in this area is inseparable from this tradition and enhances its beneficial effects on health. The recipes for major dishes have been in place for thousands of years, along with the culture of growing and using ecologically safe ingredients, along with a moderate local diet and an active lifestyle, all of which contributes to the longevity and good health of the local populace. The Adygean signature dish is called khalyuzh. It features a traditional dairy stuffing of soft white cheese and thin tender dough, which absorbs and balances the salty taste of the cheese. This differentiates khalyuzhes from other Northern Caucasian pies and bread such as pita, khachapuri, Ossetian pies or lavash. An authentic khalyuzh is covered with a thin crispy crust on the outside, while the dough inside remains soft. Drops emanating from a crispy khalyuzh are those of sunflower oil, produced in Adygea. The principal ingredient of khalyuzh is k'uae, a special kind of local cheese. Maykop, the Adygean capital, boasts just a few places where one can taste traditional dishes and pastries. The Dysheps cafe was opened by a Turkish expatriate family headed by Ibragim Chatau. They are Circassians who decided to return to their historic motherland. "Dysheps" means ‘golden soul’ in the Adygean language. Circassians love the “gold” colour, which they associate with the beauty of its women. "In our kitchen, Turkish mantys and khalyuzhes are baked by a special chef," a waitress at the cafe told us. "My own mom uses the same recipe of khalyuzh that is traditional for highland villages." When khalyuzhes are fried they must be completely covered by oil so that they can become plump and rise – that's when they are ready. Take them out and blot them with a napkin to remove excess oil. They look thicker than a cheburek pie, which deflates a bit when cooked. It is the plumpness that makes a khalyuzh so tender, as the cheese melts in your mouth. The local people believe that no matter how far you are from inner peace and harmony, a couple of khalyuzhes and a glass of homemade wine will help you get over any sorrows you may be experiencing. One khalyuzh is about 270 calories, which you can easily burn off during a hike of the beautiful surrounding scenery. 1. Knead light, elastic dough with warm milk. 2. Form a roll from the dough and cut into small pieces. 3. Roll the pieces out as thin as you can until you have circles the size of a saucer. 4. Put some crumbled Adygean cheese in the middle of each circle. 5. Fold each circle in half, press the edges together and cut the excess dough with a ravioli wheel or similar instrument. 6. Fry in boiling oil; make sure the oil covers the khalyuzhes completely. Adygea hosts the annual Whisper of the Skies festival featuring workshops by the Caucasian Yoga Association and experts in health-restoring practices and doctrines. This year's festival (May 26 – June 1) is dedicated to the 100th anniversary of Murat Yagan, the founder of Caucasian yoga. The Khalyuzh Festival is celebrated with a culinary contest on June 4. The event is held at the Rufabgo Waterfall in Adygea’s most spectacular spot on the Lago-Naki Plateau.